Recently I had the pleasure of meeting John Scheel. John is a well known consultant that specializes in business turnarounds. During our discussion, he shared with me one of his turnaround projects that had been written up in a business publication. Even though the project was completed in the 1980’s the piece captures the very essence of a business turnaround. It was such a great read and full of outstanding advice for all business people that I asked if I could publish it in this space. John graciously agreed. So here is “The Crunch of the Turnaround” in two parts but first here is a brief bio on John. 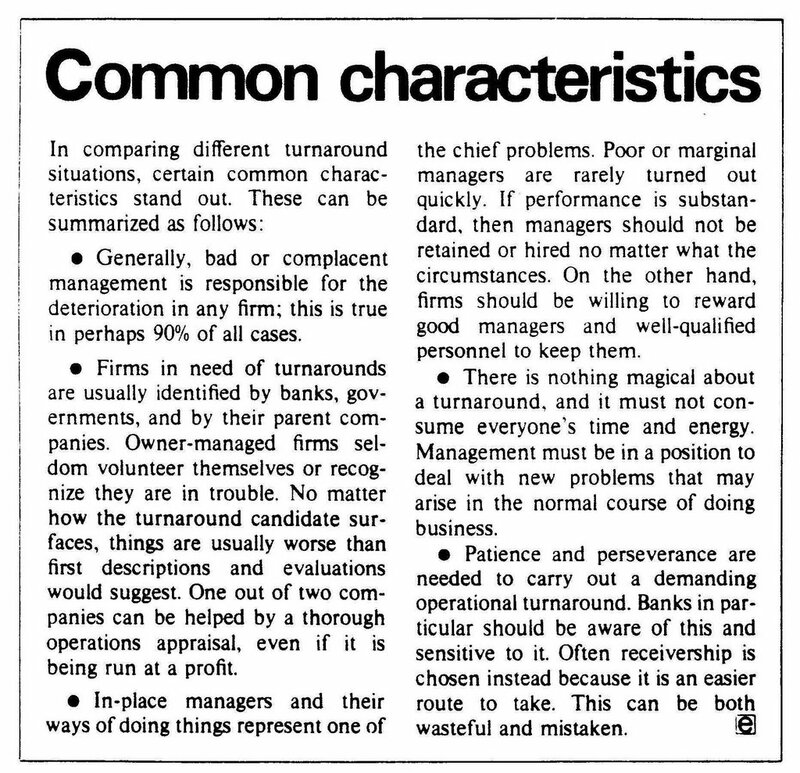 The term turnaround implies a serious need for improvement in any firm. It suggests that, for one reason or another, a company requires a one-shot effort to remove or reverse certain entrenched situations and practices which, if permitted to continue, would lead to the eventual failure of the business. There are companies in situations which by nature are terminal, and the only cure is for them to go into receivership. To decide whether a turnaround is feasible, an assessment must be made of a firm's markets and its potential. Also, an assessment must be made of the management and owners of the firm and the degree of interest and capability they display. Turnaround specialists cannot do the impossible. It is no use trying to blow up a balloon with a hole in it. Nearly always there will be questions about the ability and talent of the existing management. More often than not,' the company's difficulties have been brought on unknowingly by its managers. And, because of their own involvement, they are not necessarily the best people to respond when the crunch comes. Each management team is different. But in the turnaround process, hard choices invariably will have to be made; poor managers will have to be groomed to perform better or be weeded out. Turnarounds come in different forms. There are, for example, "financial" turnarounds which can be accomplished from a distance. The firm can be helped through a refinancing proposal, a sudden success in sales leading to one or more large contracts, or the appearance of a rich investor prepared to put in new funds. Totally unplanned events may also occur. There can be a catastrophic fire in an unprofitable plant. or the firm may unexpectedly discover a new process or product and make a profit selling out the Patent rights. In an "operational" turnaround such fortuitous happenings are not likely to help. For the turnaround specialist, the operational type of recovery is the hardest to bring about and is the most rewarding. It is a classic two-steps-forward, one-step-back process which is achieved by tough innovative work at the grass-roots level. Very little comes easily, and many of the successes will not be apparent to people who are not closely involved. The specialist in a turnaround must concentrate on setting priorities and on applying steady pressure to all functional areas with a firm. His success will depend on the use of good judgment, not unlike that exercised by a mountain climber. In short, there are many routes to the top. The big achievement is actually getting there. The purpose here is to describe the practicalities of turnaround management and lay down principles which, if followed, should greatly increase the odds in favor of success. 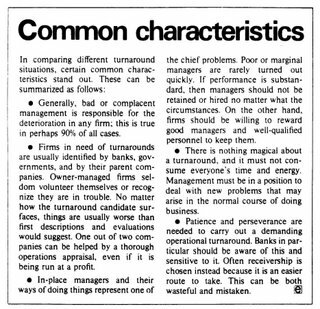 Staffing for turnarounds: Good turnaround specialists do not necessarily make good managers in an everyday operating environment. And the opposite is true good managers often fail when they attempt to mastermind a turnaround. Companies should therefore realize that the most effective way of improving things will probably not come from proposals that are made inside the firm (although, this in no way means that competent day-to-day management skills do not exist within the company). When it comes to staffing, an outside specialist has two things he can offer: First, he can weed out ineffective managers and, second, he can organize their replacement either through internal promotions or external hiring. In successful turnarounds, it is a virtual certainty that some changes will be required in senior management. The process need not, however, be traumatic or long lasting. As the company's affairs stabilize, the specialist will relinquish more and more control and authority to the new upgraded management team. How do turnarounds take shape? And what are the processes and stages involved? A typical example, may serve to answer such questions: A North American-based food Products company experienced union militancy in one of several plants - to the point where management was forced to consolidate many operations in a single plant. The confusion this caused within the company stemmed from several factors: a poorly designed plant layout, an inexperienced work force, the lengthening of the distance from the plant to the firm's established markets, and a management that seemed inactive. The firm was torn apart by quarrelling and internal bickering: there was a refusal to share responsibility, and a great deal of listlessness and incompetence throughout the organization. New problems: New problems surfaced. The tirm was unable to coordinate raw material procurement with its sales promotions and production schedules. This led to a generally poor performance. to the partial shipment of goods, to the loss of shelf space for the company's products and to customer discontent. Quality problems also became apparent. There were lost accounts, product recalls and costly off-spec finished goods writeoffs. The firm had not been doing well for a number of years. The shift of its plant operation suddenly made matters much worse. These problems all had to be tackled in the turnaround and remedies found. policy. Improvements were made in a number of crucial areas, and a systematic effort had to be made to achieve them. As an example, there was a dramatic increase in juice pressing yields. This happened in the following way: In the fall of each year (before the turnaround), the plant received thousands of tons of process fruit which was then pressed for juice. Latent and accepted errors in this operation were such that only 95 gallons of juice was being recovered from each ton of raw fruit (other competitive plants were known to yield 150 gallons of juice a ton). So the record was bad and needed to be improved. Pressing yields were poor and process variables were not being controlled; to overcome this, automatic moisture sensors were introduced to monitor pressed waste solids. Handling equipment had damaged a high proportion of the fruit in the past and had to be changed. Process temperatures had to be controlled to maximize the juice yield. Juice treatment chemicals and procedures were varied to fit the nature and type of fruit. A rotary vacuum filter was acquired to extract additional juice from a former waste stream. Filling losses in the bottling operation were reduced to 2.5% from 8%. Employees were instructed in the proper handling of equipment and preventive maintenance schedules were introduced on the night shift. Beforehand, the firm had felt its expenses could not be cut down. It was not a major juice supplier because of the inefficiency of its operation. But it believed it had to offer the product to round out its product lines and hold on to existing customer accounts. In another problem area, the minimum order was raised from 200 cases to 400 cases for customers who were distant from large urban centres. The vice-president of sales reluctantly agreed to the move. But it had the beneficial effect of increasing shipments to an economic level even though 20% of accounts were lost. Those clients who accepted the larger orders increased the shelf space for the product. This led to sales increases as well as more efficient ordering. Before getting involved, owners tend to be optimistic and underestimate the problems their firms face and they must be made aware that it may take as long to climb out of a difficult situation as it did to get into it. In the case of a privately-owned company, or one with a paternalistic style of management, change may not be welcome. A written agreement should be drawn up which outlines the responsibilities of the turnaround specialist. It is always better to get a mandate for more control than will actually be required. Agreement also is necessary on management's long-term strategy. Is it a case of improving the firm to raise the price for its divestment? And should a decision tree be put in Place to be followed as significant milestones in the turnaround are reached? For the turnaround specialist, it is essential to get the "best" story to explain what has gone wrong and provide a background for the work that needs to be done.